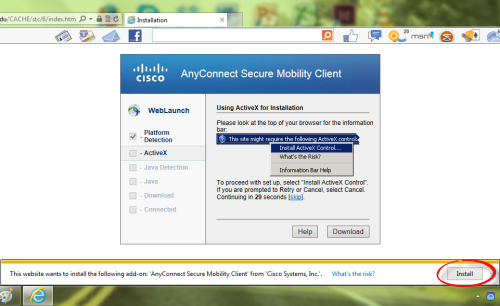 This page provides instruction for installing the Cisco VPN AnyConnect Client on your personal Windows based PC. You must be off campus to complete these steps. For more information on using VPN, see the page entitled Virtual Private Network. Note: You must fill out the VPN Remote Access Form prior to installing VPN. ITS will then configure your account for VPN connection. Step 1: Navigate to https://vpn.etown.edu. Step 2: Keep the default computer, 1-Non-College-Owned-Computer. Enter your VPN username and password and click Login. 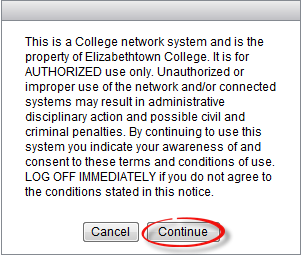 Note: The username is your Etown username, and the password is the password that you specified on the VPN form. You will be locked out after 10 unsuccessful attempts to log in. Contact the Help Desk to have your VPN account unlocked. If you are using an alternative browser such as Mozilla Firefox, go directly to Step 5. 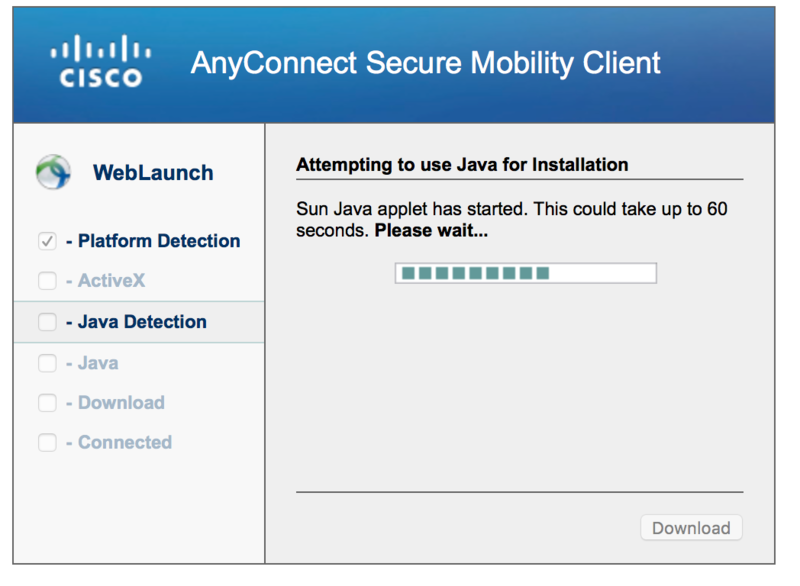 Step 4: If prompted, click Install to allow the Cisco AnyConnect ActiveX Control to run. The downloader will begin analyzing your computer. 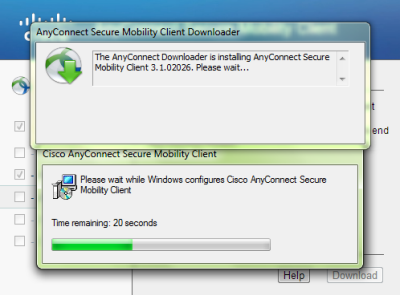 Cisco AnyConnect Secure Mobility Client will install. 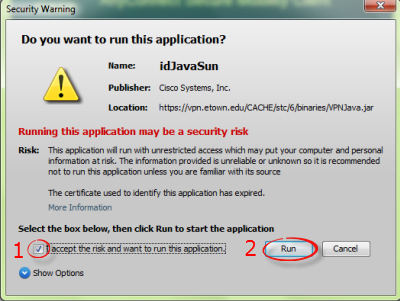 Click Yes if a security warning appears. The VPN connection will establish. You are now connected to VPN. 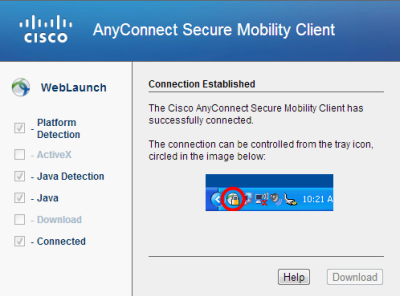 Locate the Cisco VPN icon in the lower right corner of the screen, also known as the systray. It is found next to the time and date. 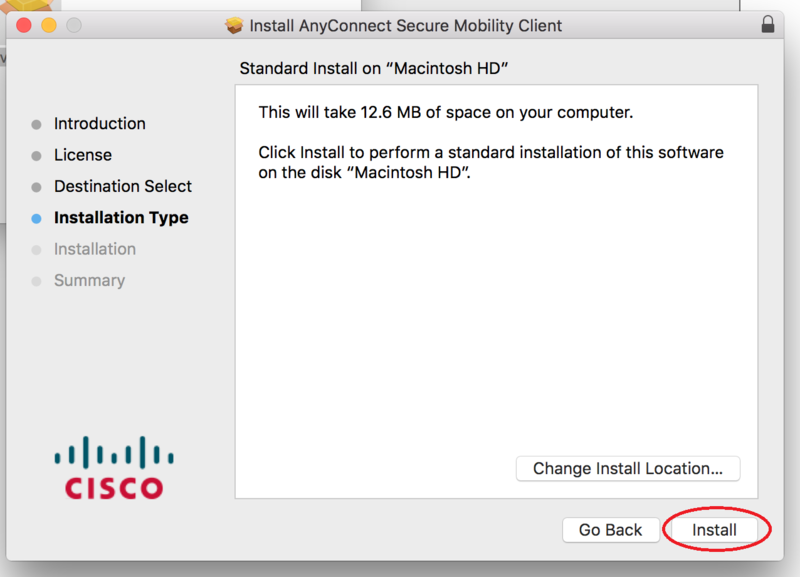 You may need to click the small upwards arrow to expand the list of programs to locate Cisco VPN. To disconnect, click the VPN icon and click Disconnect on the resulting window. Step 11:Instructions on connecting to and using VPN on your personal Windows computer. Step 1: In Safari, go to https://vpn.etown.edu. Step 2: Keep the default computer, 1-Non-College-Owned-Computer. 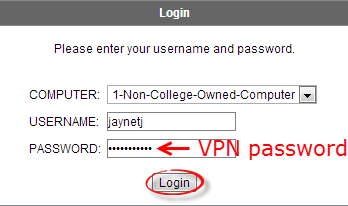 Enter your VPN username and password and click Login. 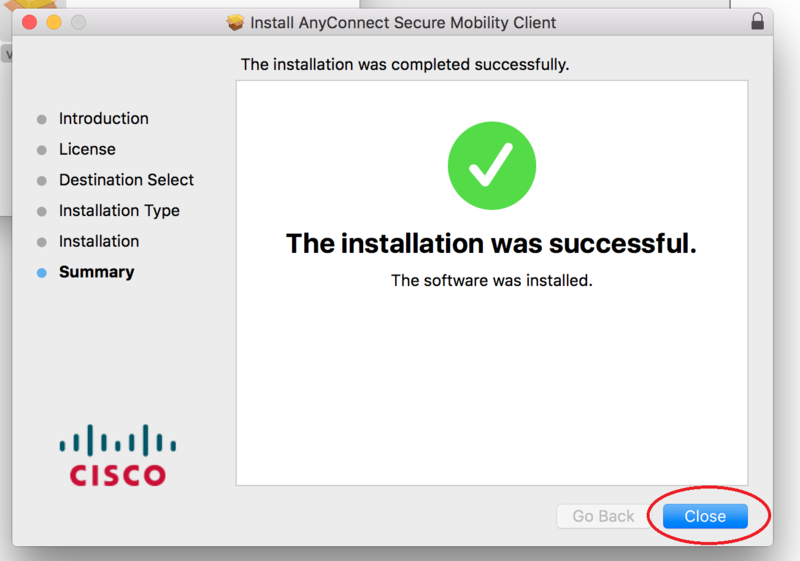 Step 3: Cisco will attempt to connect. Wait while it loads. 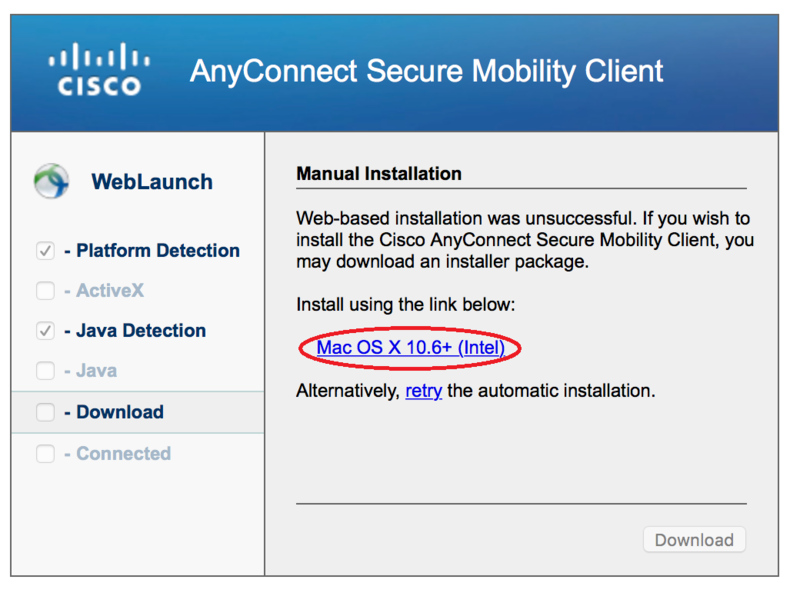 Step 5:Click on Mac OS X 10.6+ (Intel). Step 6: Click on the downloaded disk image to open. Step 7: Double-click on vpn.pkg to begin installation process. 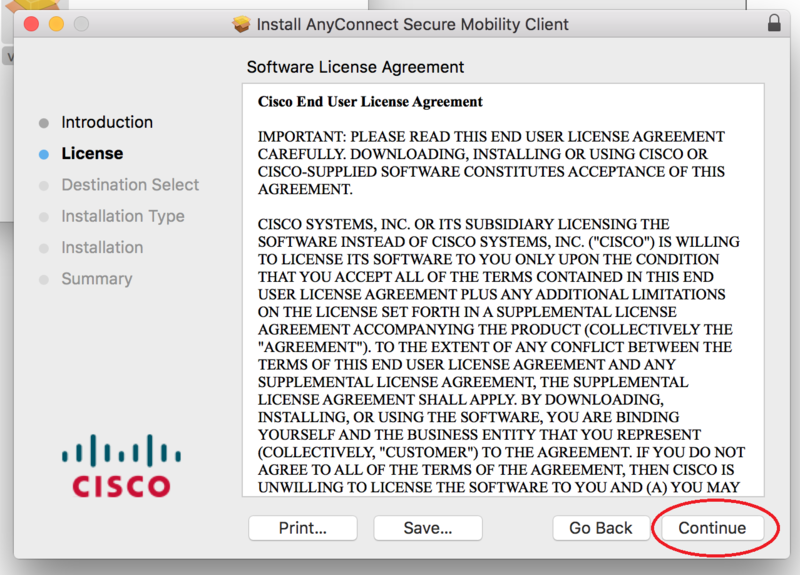 Step 9:Read the License Agreement and click Continue. Step 10:Click Agree to confirm. Step 11:Click Install to begin installation. Step 12:Enter Mac username and password, then click Install Software. Step 13:Wait while the software is installed. When it's done, click Close to close the window. 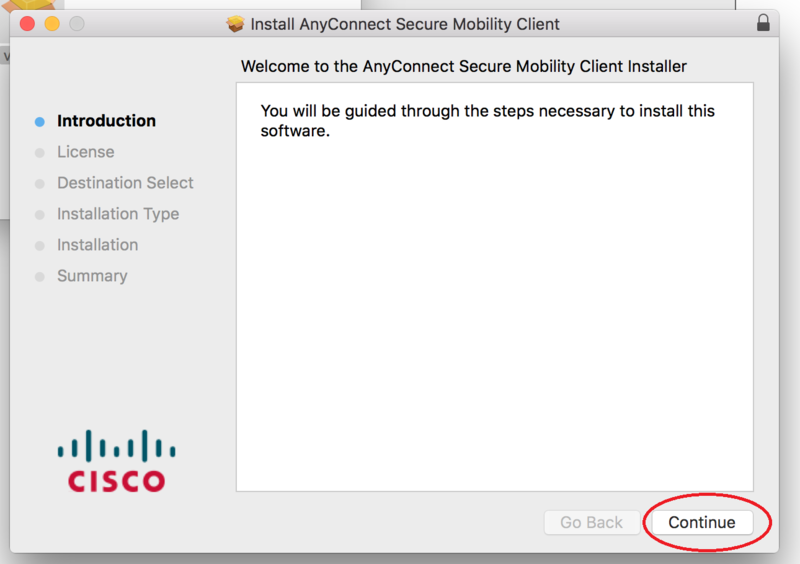 Step 14:To access, open Cisco folder in Applications and click Cisco AnyCo...obility Client. 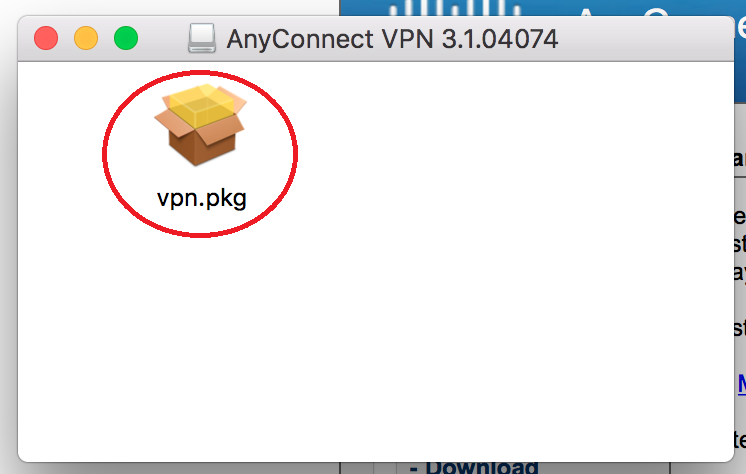 Step 15:Instructions on connecting to VPN on your personal Mac computer.